CUT THE THICKEST NAILS WITH EASE! Do you suffer from thick or painful ingrown nails? Try using Pynior toenail clippers which design most recommended by professional podiatrists. Pynior clippers employ precision cutting edges and a concave tip to make smooth, naturally contoured cuts with absolutely no splitting or cracking. Pynior toenail clippers for thick toenails was made by surgical-grade stainless steel for years of flawless cuts. 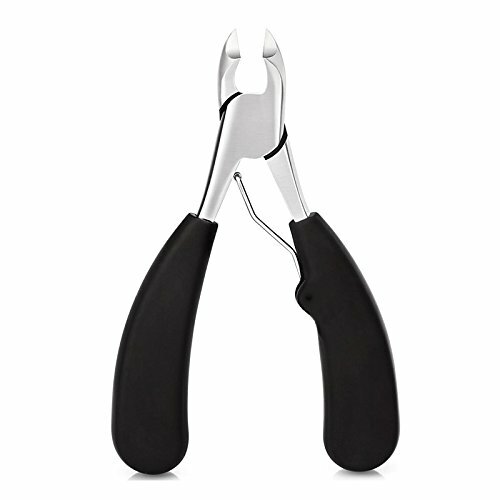 Our toenail clippers for seniors are suitable for all sterilization techniques and include a High-grade tin packaging to ensure the cutting edges stay sharp and hygienic. ▲Before clipping, soak feet in warm water for 5-10 minutes. ▲Dry toes thoroughly with a clean towel prior to clipping. ▲For brittle nails, make small clips to prevent splitting or cracking. ▲Cut along the nail's natural contour and don't round into corners. ★When use, not to pull the skin, should directly cut. ★If you have the phenomenon of inflammation, swelling or pain, please kindly disinfect the toenails and nail clipper (with iodine or hydrogen peroxide ) first, and then cut, disinfect them once again. Premium Quality Stainless Steel for durability. Sharp Blades Help Remove Hangnails and Trim Toenails Painlessly. Clippers Resist Tarnish and Rust, Easy to Disinfect. 【EFFECTIVE】This toenail clippers for thick toenails was designed to easily cut nails of all sizes, making it the best toe nail clippers for thick nails, ingrown toenails tough cuticles, and assists in treatments of paronychia, onychomycosis and other fungal nails. Ideal for seniors with arthritis or weak hand strength. 【SHARP BUT SAFE】Our toenail clippers for seniors with precision curved blade allows you almost effortlessly and very neatly to trim all kinds of big, thick nails, and other various ingrown toenails. The plastic tip cover is great for avoiding accidental injuries especially to children when not in use. 【ERGONOMIC】The dilated flexible handle of this toenail clippers for ingrown nails is constructed from heavy duty polymers and coated in a proprietary non-slip material delivering great clip. 【APPLICATION】The nail clippers have a perfect effective to paronychia, nail fungus, damage or aging etc, suitable for home and salon to use. With surgical grade stainless steel precision craftsmanship, high hardness, strong, wear-resistant, corrosion-resistant, not easy to rust, this clipper works for all disinfection technologies. 【GUARANTEED】Pynior offers quality nail clippers over the highest industry standard and impeccable customer care to ensure lifelong quality assurance! Our Customer Service team is here for you and happy to help answer ANY questions you may have. If you have any questions about this product by Pynior, contact us by completing and submitting the form below. If you are looking for a specif part number, please include it with your message.